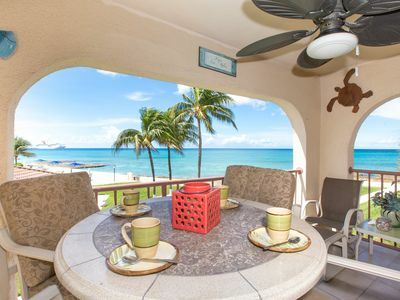 Cozy 2 Bedroom Oceanview Condo. 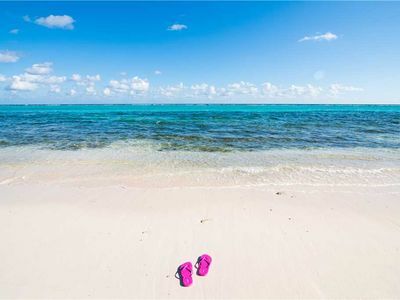 Chill Out in Sun, Sea & Sand! 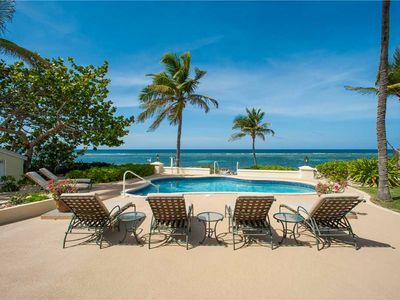 Keywords: Oceanview, 2 bedroom, 2 bathrooms with 4 balconies offering 4 different views of torquoise-cyan-azure-cerulean Carribean Sea on semi-secluded Pappagallo Beach. 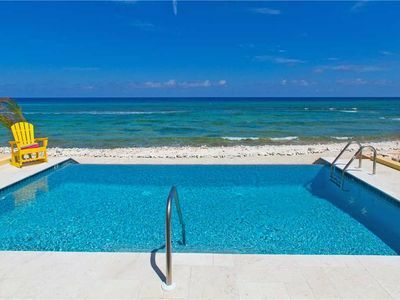 WANT A TRANQUIL GETAWAY: Located on a take-your-breath away sandy, semi-private, semi-secluded beach with a pier jutting out into the blue sea, where you can watch the sun rise or sun set - coffee or cocktails in hand and decide which color blue suits the description of the sea. Neighbouring is a National Park, home to the rare black parrot which lends its name to the beach (pappagallo is Italian translation for parrot). Within this oasis is a 5 kilometre walking/jogging trail where you can work up a sweat. 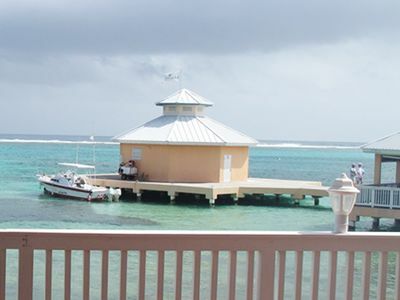 Cool down with a swim and/or snorkel session off the pier and explore the beauty of another national park - a reef underwater filled with marine and coral life of many vibrabt colors - great underwater photography. WANT SOME SERIOUS CHILL-OUT-TIME ... 20 steps from the condo will take you to the pool and Hot Tub ... 20 more will take you to a chaise longue under the shade of scattered coconut palm trees on the beach ... and another 20 will take you right to the edge of the beach where foamy waves will meet and greet and massage your feet. WANT SOME CROWD ... 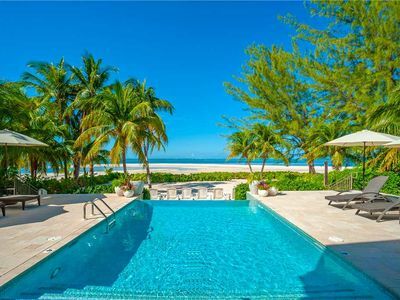 YET STILL, this location is only 7 minutes away from the hustle-bustle or hubba-hubba of the busy 7 Mile Beach, 14 minutes to downtown Georgetown where designer shopping and jewellry stores galore await, and less than 20 minutes to airport - assuming you are driving. 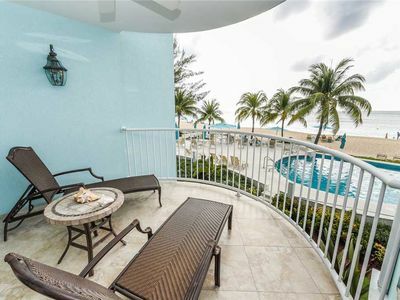 LET YOUR SENSES SWAY with the surrounding beauty of this condo - each room opening onto a balcony with a panoramic view of tiered waves kissing sandy beach, palm fronds dancing in gentle breeze, with several shades of blue sea as a backdrop. 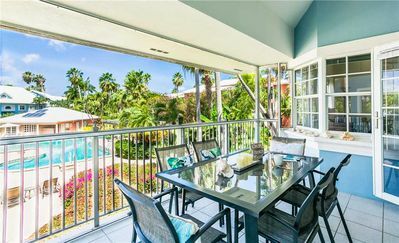 The main floor has a recently refurbished, fully equipped kitchen with new cupboards and all the spices and condiments you need for cooking, granite counters, stainless steel appliances, wine bar. This opens to a dining area and a sunken living room. On the second floor is the master bedroom with a King Sled Bedand Jacuzzi hot tub. The Guest Room has a four poster Queen Bed and adjoining bathroom which has a waterfall shower: both bathrooms are recent renovations. 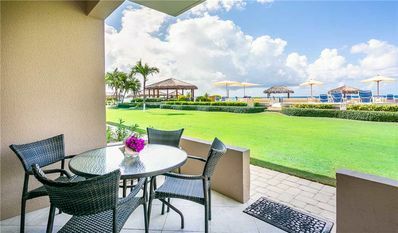 The two bedrooms have balconies with fantastic views of the Carribean Sea and the surrounding tropical flora and fauna. All rooms have air conditioning and ceiling fans. 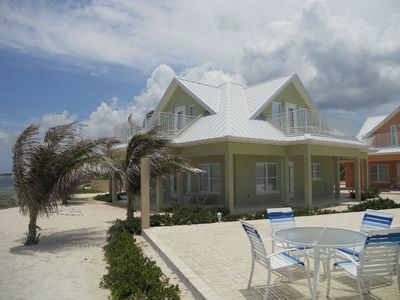 THIS IS A PERFECT VACATION CONDO/VILLA for two couples or a small familly. Equipped with a playpen sleeper that easily functions as a crib, baby bathtub, and toddler's booster chair. 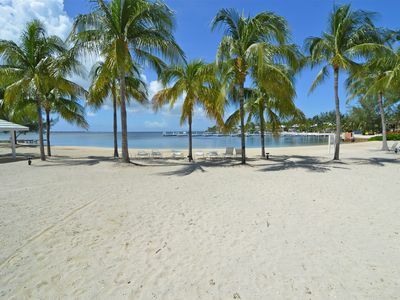 Ideal for a romantic getaway or just any getaway. 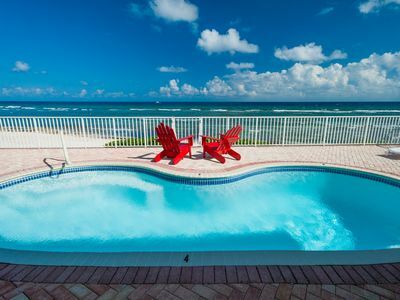 If you choose to stay in, there is mod-coms at your fingertips from cable/sattelite TV, free WIFI Internet Access, DVD, books, games puzzles and a list of restaurants that deliver right to the door. 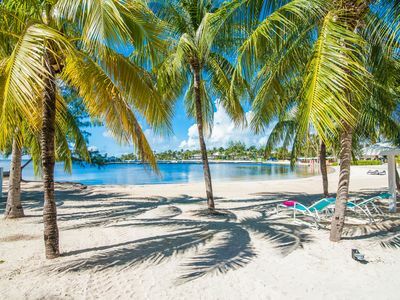 If you must venture out, there are dozens of restaurants on the island for casual or fine dining, dress up or dress down, including one of the finest Mediterranean cuisines right across the street. 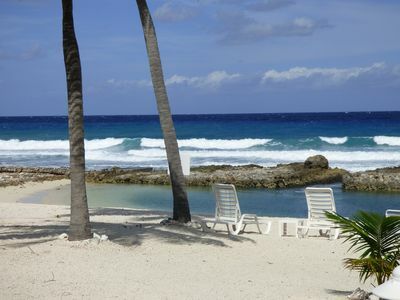 PLAN YOUR SIMPLE BEACH WEDDING HERE ... such a picturesque spot to say 'I do', Or renew your vows. A favorite with wedding photographers. Inquire about wedding planner. 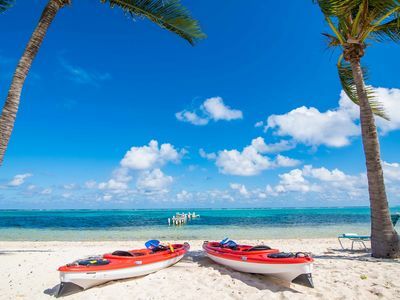 Day-time: Parasailing, windsurfing,jet sking, scuba diving - 3 equipment rentals nearby - some offering scuba diving lessons and certification, snorkelling, sailboarding, kite surfing. 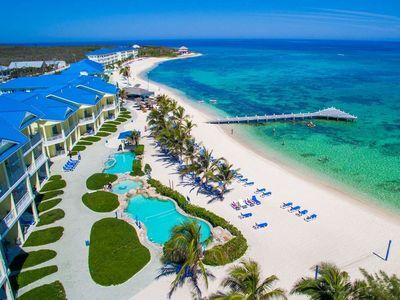 golfing, Go out to the turtle farm, swim with the dolphins, horseback riding with 2 neighbouring stables, feed and swim with the stingrays. Check out Atlantis, Pedro's Castle, Botanic Gardens, Pirate's Cave. Night-time: Open air dancing, nightclubs, local theater and cinema, 101, yes one hundred and one restaurants to satisfy any gastronomic cravings and food connaisseur appetite. All-the-time: Please drive on the LEFT side of the road. 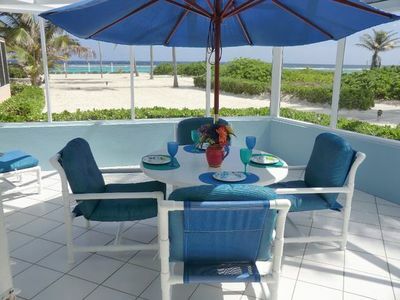 Parrot-Ise Retreat- 4 Bedroom,- Private Pool and Beach-Perfect Family Getaway! 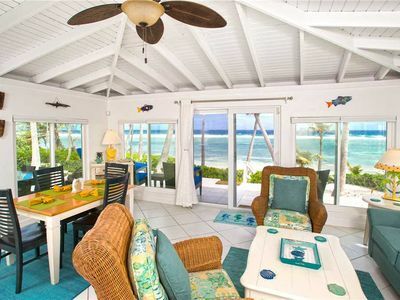 Cool Change: Cozy Rum Point Cottage on Beautiful Beach with Awesome Snorkeling! 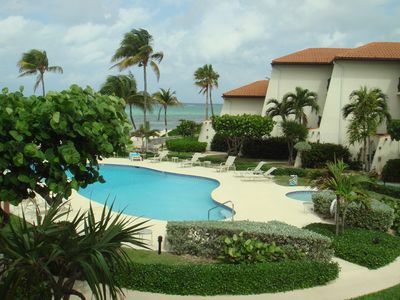 Lovely Spacious Studio on Sandy Beach - VERY Economical. Optional 2nd bedroom.